Stephen Silver has served California’s Silicon Valley and beyond for thirty-seven years. As Chairman and CEO, Stephen’s philosophy of uniting Old World opulence with modern-day luxury has earned the company a brilliant reputation among collectors of rare jewelry, magnificent gemstones and exceptional timepieces. Respect for exquisite craftsmanship and innovation has kept the company at the vanguard of elegance and taste. 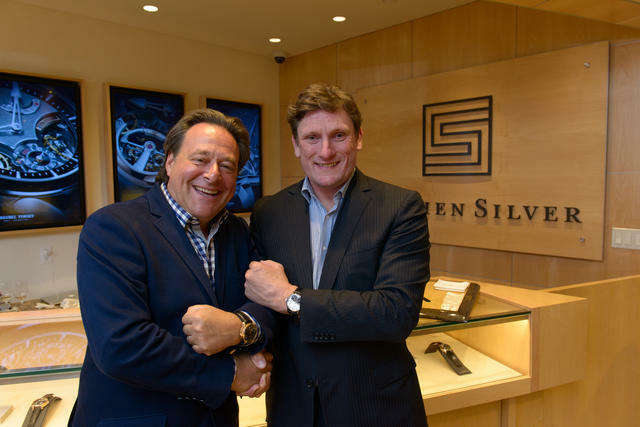 Silver took an important and heartfelt step into the future, as he worked with his son, Jared, watch industry veteran Andrew Block and Richard Caniglia to add a curated collection of haute horlogerie to their flagship retail store located in the Rosewood Sand Hill Hotel in Menlo Park, California. The company’s trademark light, modern and inviting spaces were designed by award-winning architect Joel Miroglio of MAD Architecture and Design. The company’s original boutique at Rose- wood Sand Hill is 100 square feet and designed for hosting rotating exhibits. 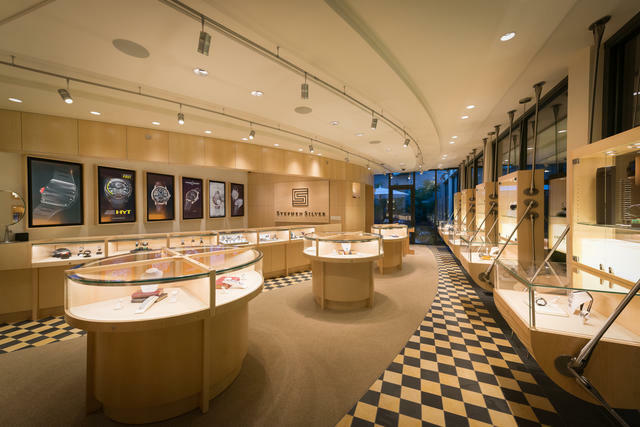 At 1,300 square feet, the flagship boutique features notable watch brands such as Audemars Piguet, F.P. Journe, Greubel Forsey, Laurent Ferrier, MB&F, and Richard Mille. The space also features a 300-square-foot private garden and private consultation room with two couches, an espresso bar, wine collection and television. The two boutiques complement the corporate offices and showroom located just 2.5 miles away on Woodside Road, where a 500-square-foot private salon houses an exceptional collection of jewelry and gemstones. “The curated collection of unique watch brands we carry positions Stephen Silver as the destination for connoisseurs and collectors of haute horlogerie. Our boutique is the only West Coast location where many of these brands can be found,” says Block. At the core of the company’s development lies its estate jewelry business, which specializes in signed and period pieces from houses such as Cartier, Tiffany & Co., J.E. Caldwell, Bulgari and Van Cleef & Arpels. They also create handcrafted, one-of-a-kind pieces via a vast network of jewelers in San Francisco and New York. In keeping with the tradition of great jewelry houses, all of the company’s pieces are handcrafted in platinum or 18-karat gold with extraordinary attention to detail. Stephen Silver also specializes in cutting, re-cutting and re-polishing diamonds, rubies, emeralds and sapphires. The store’s timepiece customer is typically one of two individuals: the collector interested in adding a rare or limited production piece to his collection and the young-to-middle-age gentleman looking to purchase his first or second watch. They visit for milestones in their lives, and given the location in the heart of the world’s venture capital and technology industries, these often include the sale of a company through merger, acquisition or IPO. In addition, business travelers and watch collectors often make Stephen Silver a highly anticipated stop when in the area. With a desire to share its success with members of its community, Stephen Silver regularly supports more than 30 organizations, including the V Foundation, Hero Foundation, All Stars Helping Kids, and a host of local schools and art programs. An annual anniversary party is held each year for clients as well as the public, ensuring the opportunity to greet old friends and make new ones.